Over winter break, I enjoyed some delicious granola that Evan's mom made. I got the recipe + her own changes from the original. I made a batch last week with a few changes, so I could kick off 2015 with healthy breakfasts. I love the simplicity of granola. You really can't screw it up. Throw in oats and any kind of nut, and you're good to go. My kind of recipe. I serve this with blueberries, milk and chia seeds (coffee on the side!). I am loving it! Preheat oven to 325 degrees. Line two large rimmed baking sheets with parchment paper or foil. In a LARGE bowl, combine the oats through almonds. Stir to mix it up! In a medium saucepan, combine the brown sugar through vanilla. Bring to a boil, then remove from heat and pour over oat mixture. Stir to coat evenly. Divide granola between baking sheets. Bake for 15 minutes, stir, then bake for another 15 minutes (for a total of 30 minutes). Allow to cool on baking sheets then stir in coconut and cranberries. This sounds delish. 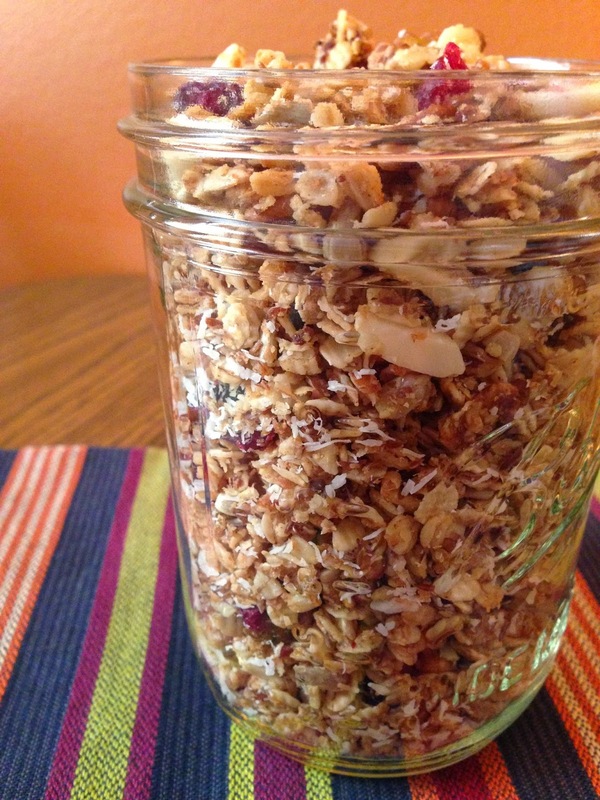 The last time I made granola I failed hard (it was not granola-y enough, and never really dried out if you will.) Maybe this recipe will be my come back.